Jineolojî literally means ‘women’s science’ — the word derives from jin, Kurdish for woman. Jineolojî is a critique of the approaches of positivist social sciences, which uphold the structures of states, patriarchy and capital. For the Kurdish women’s liberation movement, jineology is the fundamental theoretical underpinning of new forms of social organisation: it involves engagement with left-wing intellectual traditions and new ways of studying the human past in order to understand the roots of the marginalisation of women — here understood in the widest sense of the word, and inclusive of non-binary people too. Jineolojî is also an international organisation, which has previously held conferences and camps in the Middle East, Europe and Latin America. 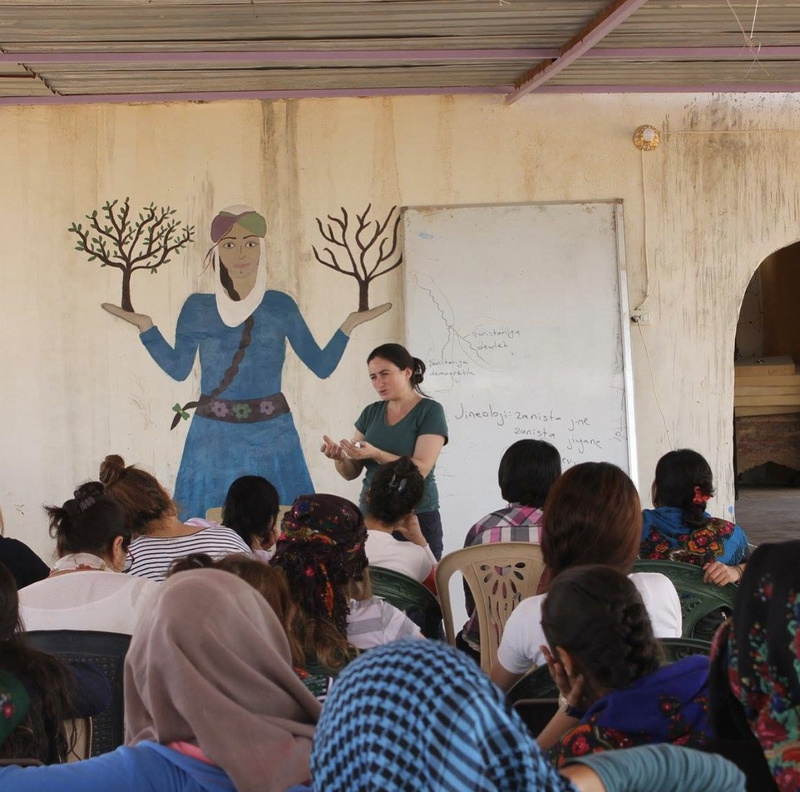 The UK’s first-ever jineology camp was held in January 2019, dedicated to the memory of Hêlîn Qereçox (Anna Campbell). Over 30 women attended, from different autonomous left and Kurdish movements from across Europe. Jineolojî asserts that women gendered oppression and patriarchal power emerged in the Neolithic period concurrently with state structures and early forms of capital accumulation, and that women’s history — and in particular the matriarchal forms of social organisation predating the Neolithic — has been forcefully erased from mythology, archaeology and history. The triumvirate of power embedded in the states, capitalism and patriarchy have embedded a form of implicit bias into all scientific and historical inquiry, asserting that men, as analytical and powerful thinkers, are naturally entitled to hold power over women’s lives. Following Abdullah Öcalan’s writings, the Kurdish women’s movement is challenging and ‘killing the dominant masculinity’ in all men involved in the wider Kurdish movement. During the weekend, the fundamental theoretical understandings of jineology were thoroughly presented. Also covered were the historical and theoretical developments of the Kurdish liberation movement and the establishment of democratic confederalism in Rojava. We heard presentations and gave talks on queer theory, feminist anti-fascism, women in the trade union movement and the history of witch hunts. We practiced knife-fighting techniques and learnt Kurdish dancing, while our vibrant political discussions and sharing of stories and experiences continued throughout collectively cooked meals and by campfires. We also discussed ways of expressing practical solidarity with Leyla Güven and the other hunger strikers imprisoned in Turkey. Perhaps the most important takeaway from the weekend was the commitment of our Kurdish sisters to a social revolution through women’s liberation. Through practices such as co-chairing and women’s assemblies, and through re-education programmes aimed at both women and men, women have gained real political power, knowledge and autonomy in the very birthplace of patriarchy. The Kurdish movement, with its dedication to direct non-state democracy and ecological principles, has formed its organisation around the principle all autonomous feminists know to be true: freedom for all can only be achieved through freedom for women.